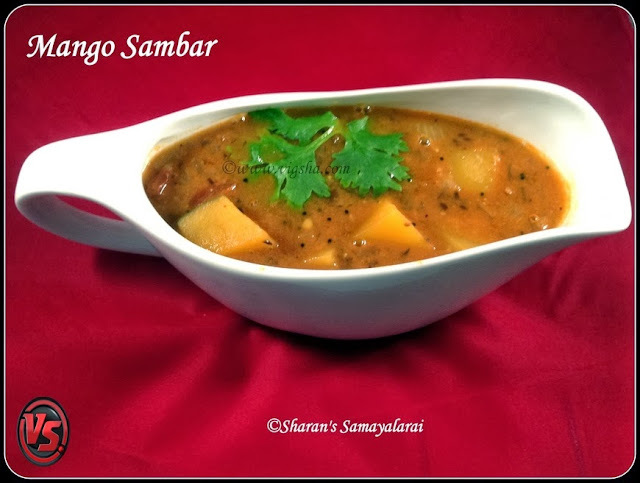 Mango Sambar is a delicious variation from the usual sambar. The taste of mangoes cooked in sambar adds more flavor to this gravy. It goes well with plain rice and tiffin varieties like Idli, Dosa, Pongal and paniyaram varieties. 1). Pressure cook dal for 4 whistles with 1 cup of water, turmeric powder and few drops of sesame oil. Mash it once done and keep aside. Extract the juice from tamarind and keep aside. Wash the mango and remove the pith,cut them into huge chunks, keep it immersed in water until use. 2). Heat oil, add mustard seeds, fenugreek and cumin. When it splutters add hing and curry leaves. Add chopped onion and fry till transparent. Then add chopped tomatoes and fry till soft. 3). Add the mango pieces along with tamarind extract, sambar powder, chilli powder and salt. Mix well and bring to a boil. 4). Mango pieces will get cooked quickly* (3-4) minutes, check now and then. Cook till the mango pieces becomes soft. Finally, add the cooked dal(with 1/2 cup water if needed) and when it boils briskly, switch off the flame. Serve with steamed rice and Vadagam ! # Cut the mango into chunks. Don't chop it into smaller pieces, it will become mushy. # Mango pieces will get cooked in just one boil. Don't you over cook mango(the skin will separate from flesh if over cooked), then the whole sambar will look like a mess. # Mango by itself has tangy taste, so use only half the tamarind you use usually for the normal sambar. # You cal also add brinjal & drumstick. But cook the veggies first and lastly add the mango pieces while adding the dal. Otherwise mango will get cooked quickly and melt into the sambar, leaving their skin.